Macy’s, Inc. (NYSE:M) has bounced back strongly from the Great Recession, with the share price rising more than sevenfold since bottoming below $6 in late 2008. CEO Terry Lundgren has done a lot of things right as he has turned the company around: customizing store inventories, improving selling techniques, and rapidly growing online sales. Nevertheless, Macy’s, Inc. (NYSE:M) stock is starting to seem overvalued in light of a few challenges that may hurt its future growth. 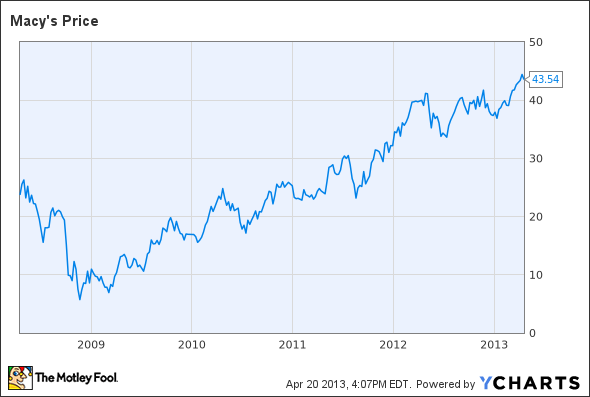 Macy’s Stock 5-Year Price Chart, data by YCharts. As of Friday’s close, Macy’s, Inc. (NYSE:M) stock traded for $43.54, which is 12.6 times last year’s adjusted EPS of $3.46. If, as analysts expect, Macy’s, Inc. (NYSE:M) continues to grow EPS at a double-digit rate, this is a fair price. However, there are a few factors that could cause earnings growth to stall out, leading to a significant correction in the stock. The biggest headwind for retail stocks in general — and Macy’s, Inc. (NYSE:M) stock in particular — is the sluggish consumer spending environment. The U.S. economy will be pinched this year by the combined effects of higher payroll taxes, higher income taxes on the wealthy, and lower government spending. These headwinds have led to shaky consumer confidence readings in recent months, and may already be impacting retail sales. According to the U.S. Department of Commerce, March retail sales fell 0.4%, following a 1% gain in February. Discounters such as Wal-Mart Stores, Inc. (NYSE:WMT) and Target Corporation (NYSE:TGT) have reported top-line pressure as consumers cut back on discretionary spending. Target recently announced that same-store sales will be flat in the first quarter and earnings will miss the company’s earlier guidance due to unseasonably cold weather in much of the country. To some extent, Wal-Mart Stores, Inc. (NYSE:WMT) and Target Corporation (NYSE:TGT) are more at risk than Macy’s, Inc. (NYSE:M) in the current economic environment, because their customers are more likely to live from paycheck to paycheck. However, the effect of bad weather on seasonal merchandise sales could hit Macy’s, Inc. (NYSE:M) as well. A sales or earnings miss this quarter could cause investors to reevaluate Macy’s stock, because the company has consistently beaten estimates in recent quarters. Moreover, discount retailers have not been the only ones to strike a cautious tone. Upscale department store Nordstrom, Inc. (NYSE:JWN) provided a 2013 revenue and profit outlook that missed analysts’ expectations back in February. In fact, Macy’s was one of the few major retail chains to offer a solid 2013 outlook. With other successful retailers above and below Macy’s on the price ladder expecting a challenging year, Macy’s shareholders may need to rein in their expectations.